The Sincere Wish to Help and Relieve Suffering -- In life, disasters happen and people fall into hard times. What they truly need at such a time is genuine, sincere love from people who come to their aid. Such people are bodhisattvas. Just as in the night, it is the darkness that makes light such a necessity, in the same way, it is because people are suffering that bodhisattvas are so needed. In the aftermath of Typhoon Haiyan (Yolanda) in the Philippines, we can see many real-life bodhisattvas right here in our world, who go to the disaster areas, heedless of the material hardships they have to endure, just to work to alleviate people's suffering. Many genuine stories of the kindness and beauty of human beings emerge in such times of disaster. For example, when the esteemed doctors, Supt. Kao of Hualien Tzu Chi Hospital and Dr. Wang, president of Tzu Chi University, went to the disaster area to provide free medical services, they could only conduct medical consultations by the roadside in a makeshift setup, having been squeezed out of the building due to lack of space. Yet, they still gave their services happily and willingly because they simply wanted to help the disaster survivors. When patients were few, they even rode around the neighborhood on the tricycles used in the Philippines to make announcements about the clinic and invite anyone feeling unwell to come and take advantage of the free services. In their sincere love and wish to help, we witness the bodhisattva spirit. Lessons for Giving Balanced Aid -- In the aftermath of a disaster, many survivors suffer post-disaster trauma which immobilizes them. Lost in their sense of despair and hopelessness, they will need more than just material aid or loving care to help them move on. That is why providing relief aid after a disaster really requires the balance of wisdom and compassion. Though the pain of the survivors breaks our hearts and we have quickly gone to the disaster area in the Philippines to share in their suffering, be with them, and give them help, yet we need to remember our goal—to lift the survivors out of their traumatized state and inspire them to find their sense of hope and the energy to pick themselves up and rebuild their lives without feeling a sense of dependency on others' aid. So, to really help them in this way, the love we give needs to be balanced, and we need to really use both wisdom and compassion in designing our aid program. If our program can mobilize survivors to set aside their pain for constructive action, while inspiring their generous and charitable spirit to work hard to quickly rebuild their lives and help their community recover, then truly, they will find the strength within themselves to move on again. Aid Recipients Also Giving -- In the days of Tzu Chi's cleanup drive in Tacloban, Philippines, many disaster survivors came to understand the underlying concept of Tzu Chi's bamboo bank: every tiny contribution is like a drop of water that collects to form the great ocean, and the coins donated, through the good they do, will have a never-ending impact, like the drop of water that will never dry up having become part of the ocean. So, many survivors, despite having little, made PET bottles into coin banks to start saving coins in. One local resident even went out of his way to make a bamboo one as a tribute to Tzu Chi's origins, when the first members of Tzu Chi put a coin every day into coin banks fashioned from bamboo. When people have love like this, there is so much hope for a better future. What We Realize from the Disaster and What We Set Out to Do -- From the disaster in Tacloban, Philippines, we see the impermanence in life. Suddenly, everything changed and people's lives went from heaven to hell, just like that. In short moments, they lost everything and their dearest ones were turned into bodies that gave off a stench as they decomposed. Doesn't this cause them to feel great misery and pain? From all this, we are confronted with the reality that the body is in fact not something clean and immaculate, and that in life, our feelings cause us torment. To help survivors recover, we must help them to overcome their trauma first. Witnessing how people's hearts were in a state of utmost despair and distress after the disaster, we quickly went to mobilize them and uplift their spirits through a community cleanup and development program, so they can learn to open up their hearts to live in the present and face reality, and get into constructive action—then, they can rebuild their lives. Now, after our bodhisattvas' efforts, we see them pick themselves up to begin anew. I really feel so happy for them and wish them well. To Offer Help Without Needing to be Asked -- After serving for over a month in the disaster area and completing a challenging series of large-scale aid distributions to close to 30,000 families living in 136 barangays of Tacloban City, our volunteers went to visit the barangays where we had not yet distributed aid. They went to learn more about the conditions to see if the residents there had also been devastated by the disaster and whether they would need help. Though the relief phase of our aid program was coming to a close, and the volunteers soon needed to leave the city, they still wanted to visit these barangays farther away to see if people needed help. 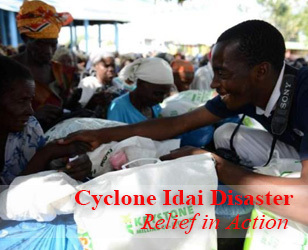 They did not want anyone devastated by the disaster to be left out of our cash aid program. So, without needing to be approached for help by locals or the government, our volunteers took the initiative to visit more areas. Though they had to leave the city in a few days, they will go back at a future date to distribute cash aid to people in need in these barangays. Lighting Lights in the Darkness -- When disasters happen, people are plunged into a dark hell. When we are in the darkness, we will cherish even the tiniest light. When light after light is lit up in the night, they can enable us to see a path that we can take, and we can walk on it safely and move onward. So long as we keep going, we can eventually come out of the darkness, just as daybreak comes at the end of the night. This is the way it is when disaster turns people's lives into a dark hell. When bodhisattvas go to provide aid to lessen people's suffering, they are providing a light in the dark, helping people in darkness to find their way so they can keep going. Awakening Love and Goodness -- In helping others, we ask for nothing in return. When we are truly sincere in caring for people, it can awaken their love and goodness, and this is something that makes us very happy, for these qualities will begin to give them inexhaustible spiritual riches. In the Philippines, we have been very heartened by cases of love and goodness being inspired in the survivors of Typhoon Haiyan. In Tacloban, there was a young man who had received 1,500 Pesos from Tzu Chi as part of our relief program where we had organized a community cleanup drive and invited survivors to participate, giving them a cash gift of 500 Pesos at the end of each day for their contribution. After three days, the young man approached us to return the 1,500 Pesos he had received from Tzu Chi. It turns out that originally he had participated in our program, but had not worked very diligently during the cleanup effort. But, seeing the sincerity of the Tzu Chi volunteers in helping all survivors and feeling their love and care, he started to look at himself and think, "How much did I in fact contribute to the cleanup drive these past three days?" After his self-reflection, he considered that he had not made enough of a contribution to warrant receiving so much money. With his conscience activated, he could not be at peace with accepting the cash gift, so he decided to return it. Seeing his genuine contrition, our volunteer told him to hold on to the money as he would really need it to recover from the disaster, and encouraged him to contribute more from now on. He understood and devoted himself to the cleanup effort for many days afterwards, working hard to help his community recover. A New Life after Disaster -- In Tacloban, we not only see the city beginning to come back to life, with stores reopening for business and people beginning to work on rebuilding their lives, we also see that survivors have started to come out from the trauma of the disaster because they have learned to see that as long as they are alive, there will be hope. 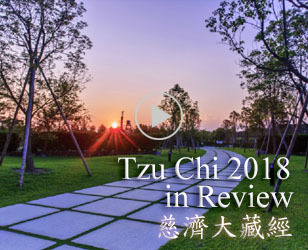 From Tzu Chi volunteers’ example and interactions with them, they realize that they still have many things to be grateful for in their life and they have come to find contentment. Their hearts have started to open up and they are ready to rebuild. What makes us happiest is to see that some people have even gained a new life direction: after many days spent working with Tzu Chi volunteers to clean up their community, for which they received Tzu Chi’s sincere encouragement and cash aid, many locals have resolved to give up alcohol, smoking, gambling, and many other vices that used to be central to their lives. 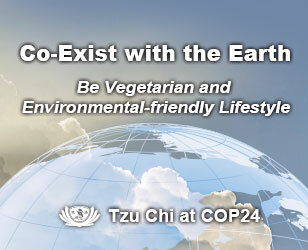 They want to emulate the Tzu Chi volunteers and from now on begin to live a more wholesome, meaningful life. From them, we can really see that everyone has goodness inside them, and this goodness is human beings’ true nature. Seizing Causes and Conditions to Awaken the Bodhisattva Spirit in People -- After hearing of the disaster in the Philippines, our local volunteers from a poor village in Honduras decided to hold a local fundraiser. Besides setting up donation boxes, different people contributed goods to sell for charity and an audio equipment company even generously let the volunteers use whatever equipment they needed for the event for free. We can see that the disaster inspired people to bring out their love. Indeed, the suffering of disaster survivors can provide the causes and conditions to awaken the bodhisattva spirit in people if we act quickly and seize upon the circumstances to reach out and inspire people's love and care for the survivors. It is our sincere hope that in everyone's hearts, seeds of love can sprout and people can thus become rich in heart. Love From People in Suffering -- In Indonesia, a woman who makes her living scavenging from the landfill site near her home also donated money to help the typhoon victims in the Philippines. When she learned about the people’s plight, her heart really went out to them because she could imagine how hard it must be to suddenly lose everything one has—one’s home, job or business, and everything one has worked hard for, all destroyed overnight. Her family is very poor, having to live off of what leftover food the garbage truck dumps in the landfill, yet having lived in such conditions for years they were still able to withstand the hardship and survive. She felt that in comparison, the typhoon victims had it much worse because they had to cope with sudden and total loss, not to mention the trauma from the disaster and the pain of losing loved ones. So, she wanted to help. Despite having little, she still donated what little she had. In Jordan, Syrian refugees did the same. When they learned about the Philippine typhoon from Tzu Chi volunteers who help them with their difficult lives as refugees, they could empathize with the material hardships the victims faced and willingly made a donation. Though small in amount, these donations carried with them a lot of love. As we can see, the power to help others comes forth from the heart—it arises from love and compassion which move us to give, and by giving, even a little, it becomes possible for people in need to be helped. No One is Too Poor to Give -- In this world, there is no such thing as being so poor that one can give nothing—everyone can contribute something. We can see this in the Dominican Republic. At the school we built there to benefit an impoverished community that originally lived off of a landfill, the teacher told students about the devastating disaster in the Philippines and encouraged the students to help. One student, having no money to donate because her family had so little, brought a small bag of cornmeal to offer as a donation. Another child not only donated the few coins he had been given as spending money, but also contributed a small package of noodles for a charity sale. The children had such a pure heart of wanting to help, even though they could only contribute a small amount. When Tzu Chi volunteers were collecting these donations, they were so moved that they teared up. Sincere love is truly most powerful and moving. And it is especially moving that even in communities as impoverished as this one, such pure love and giving is being brought forth. No Good Deed is Too Small -- When people are in a dark hell, they really need light; even the tiniest glow from a firefly is still a help in the darkness. When we respond to others’ suffering and do something to help, every bit of giving brings light to the darkness left by disaster. No good deed is too small—the worst is not doing anything at all. Responding to Others' Suffering and the Ripple Effect of Love -- Everywhere, people's love is being activated to help the Philippine survivors. Even an inmate in a U.S. prison made a contribution, sending 21 cans of instant coffee and 80 stamps to our Tzu Chi office. Because he could not send money from the prison, he hoped that Tzu Chi volunteers could help him auction off the goods and donate the proceeds to our Philippine disaster relief. He was responding to others' suffering and reaching out to help. Many people, touched by his kind intentions, paid for cans of coffee but did not take them, letting them go on to raise even more donations for the disaster relief. One person even paid US$3,000 for some of the coffee. The inmate's love and kindness went on to inspire the love of many people, and the impact is still continuing. This is the ripple effect of genuine love. The Greatest Blessing is to be Safe and Well -- It is a blessing just to be safe and well. Having a lot of money is actually not the most important thing in life. As we can see from the Philippine disaster, people may be wealthy and enjoy a very comfortable life, but when disaster strikes, they also lose all their material possessions just like everyone else. This is the kind of impermanence that exists in life; at any time, something may happen which takes everything away. The material things in life aren’t the most important. Impermanence is a reality of life that we need to realize, so we can live meaningfully.